Be sure to make a stop at the Astoria Sunday Market during your summer weekend getaway to Clementine’s Bed and Breakfast! From our B&B in Astoria’s historic district, It’s just a five block stroll past the Garden of the Surging Waves. 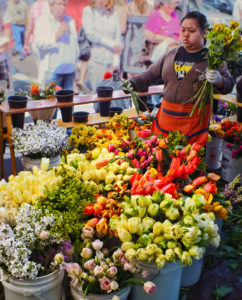 From mid-May and mid-October, the Market draws thousands of visitors to Astoria’s historic district on Sundays. It’s the second largest market of its kind in Oregon! Explore the Sunday Market between 10:00 am and 3:00 pm each week. You’ll find about 170 vendors offering products that have been grown, gathered, or created by local farmers, craftspeople and artisans. The products are reviewed by the Sunday Market to assure their quality and authenticity. About one-third of the vendors offer fresh produce and artisan-crafted foods. Others offer everything from art to jewelry, and distilled beverages to a wide variety of handmade crafts from wood to ceramics. Lisa Sophia is the 2018 featured artist. Don’t go just to shop for artisan gifts or foods – there’s entertainment, too! The Market features live music each week in its food court. Check out this video, and visit the website for a guide containing more information about the performers, vendors, and special events. Here’s a sampling of the regional entertainers performing this summer and fall. August 5, 2018: Jazz and blues vocalist Elena Welch who has recorded four popular CDs. August 12, 2018: – Dave Quinton & Brad Griswold play folk, country, bluegrass and swing on guitar, banjo and mandolin. August 19, 2018: Castletown’s AmeriCeltic music ranges from jazz and blues to rock ’n roll. Their new CD is Fired Up Folklore. August 26, 2018: Swing Cats of Astoria feature swing era tunes, plus some blues, bossa nova, and rock ‘n roll. September 9, 2018: Double J & The Boys, a folk/country band, treat listeners to their own tunes as well as classics. September 16 and 30, October 14, 2018: Greg Parke’s ballads and dance music feature his own original tunes. September 23, 2018: Two Crows Joy combines vocals and guitar with fiddle, banjo, drums, bass, and keyboard. Their original music blends classic rock, Celtic, and country into a unique style. October 7, 2018: Ray Prestegard’s original songs feature banjo, ukulele, dobro, and guitars. Savoring Astoria Sunday Market’s bounty is the perfect way to continue exploring Pacific Northwest cuisine after your multi-course gourmet breakfast at our B&B. If you’re staying in one of our vacation rental Moose Suites, it’s a great place to shop for breakfast! Enjoy some casual shopping and sample some tasty treats while you listen to performers from the local music scene. The Market is just a short walk from our historic district location on Exchange Street – walk the three blocks to the Garden of the Surging Waves, then turn down 12th Street to the Market. The Sunday Market disappears during the winter months, so don’t wait to give us a call at 503-325-2005 or go online and reserve your weekend getaway soon. This entry was posted on Saturday, July 28th, 2018 at 3:40 pm and is filed under Attractions, Clementine's Bed & Breakfast News, Food & Drink, Shopping. You can follow any responses to this entry through the RSS 2.0 feed. Both comments and pings are currently closed.